How does partisan bias affect our reasoning? The fallout from the sequester is a good illustration. As usual Democrats are blaming Republicans, conservatives are blaming liberals. Are we thinking freely, or are we simply allowing our ire to fall along party lines? Who’s really to blame for this predicament? The press has done a thorough job of reporting the partisan finger-pointing and the government’s catastrophic warnings. But it’s not as easy to find facts on the heart of the issue. It sounded like a worthwhile endeavor at the time: it provided the government some immediate cash and gave Washington 17 months to come up with a plan to cut $900 billion from the budget. As we’ve all learned from arguments with our significant others, bringing up a side issue can keep us from dealing with more difficult, deep-seated matters that lie at the root of our problems. Sometimes it’s easier to fight about who took the trash out last than admit that neither of you have been living up to your promises. The tax debate is a completely separate issue from the sequester agreement. Any discussion as to whether taxes on the rich, the middle class or anyone else should be raised is merely a diversion. Both parties mutually agreed to cut $900 billion from the budget. Tax revenue is immaterial. Discretionary programs rarely get cut because it’s generally not in a politicians’ best interest. For every lawmaker who is attempting to make cuts to a program, there’s another who is championing its cause, supported by a lobby of constituents who benefit by it. We rarely see groups demonstrate their gratitude when politicians make tough budget decisions. But when programs are cut there are always angry factions. Unpopular politicians don’t get reelected. Deal making (“I’ll save your program if you vote to save mine”) is rampant. There’s no repercussion to politicians when budgets aren’t passed or if we spend more than we have. The government simply borrows more or the Federal Reserve prints more money to pay the added expense. The House and Senate have not agreed on a budget since 2009. We need to focus on solutions to the root problem. If Congress’ pay, future pensions and/or ability to run for reelection were tied to passing balanced budgets, lawmakers would have a much greater incentive to be judicious about spending. If Americans were no longer sidetracked by partisan battles, legislators would quickly learn that there was no place to pass the blame. Please share your thoughts (anonymously if you’d like) here. 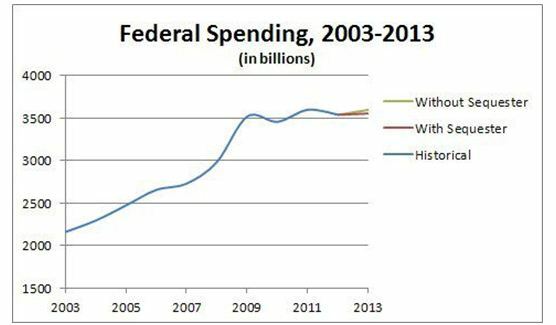 By Free to Think in federal spending, IN THE NEWS on March 4, 2013 . OMG, how do these politicians have the nerve to actually look themselves in the mirror each morning? This is really an excellent analysis, and I agree that solutions must address the root causes. I like your idea of tying a balanced budget to future political endeavors and salary. I would add that term limits would go a long way toward fixing this (and many other problems). A senator or representative who is unconcerned about reelection will vote smarter than someone who is forever trying to win a popularity contest. The primary difference between WDI and Web Dev 100 is time (480 vs ninety six hours spent in class).